Pro-Russia bloc forming in Europe – stay tuned for coups and terrorist attacks! The Coup Factory (National Endowment for Democracy, National Democratic Institute, Brzezinski, Nuland, Soros, and friends) has been hard at work undermining the governments of any countries that get too close to Russia. One recent example is Macedonia, where Soros-man Zoran Zaev attempted (and failed) to stage a coup against Prime Minister Nikola Gruevski. “I watched and listened to the head of the opposition… informing me that he is collaborating with a foreign intelligence service,” Gruevski said. Victoria Nuland, the Assistant Secretary of State for European and Eurasian Affairs, recently attempted a Kiev-style putsch in Macedonia aimed at overthrowing that nation’s democratically-elected government of Prime Minister Nikola Gruevski. Gruevksi, unlike many U.S.-installed and -influenced governments of the region has been reluctant to apply sanctions against Russia over Ukraine. Russia has been keeping a close eye on coups around Europe since the 2014 Euromaidan disaster in Kiev, and is now restating their desire for an OSCE document that bans “anti-constitutional coups”. The leader of a Macedonian opposition party has been charged with attempting to blackmail the country’s prime minister and to take over the government; Russia demands a thorough investigation into the alleged plot. “This situation proves once again the importance of Russia’s suggestion the OSCE should adopt a document banning anti-constitutional coups,” the foreign ministry said. 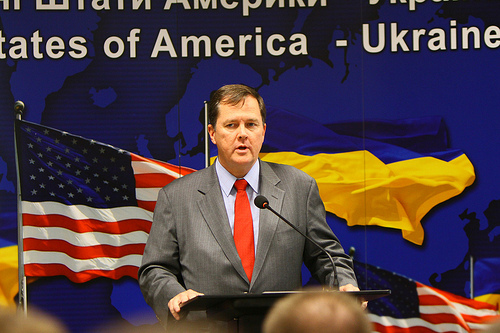 Meet Thomas O. Melia, the US State Department specialist in color revolutions and destabilizations, as well as Deputy to Victoria Nuland. “We support Macedonia’s European aspirations and we would urge all Macedonians inside the Macedonian government and outside to look to those European standards because they have done well for many of your neighbors and in fact for most of Europe,” Melia concluded. Thomas Melia, who is Deputy Assistant Secretary of State in the Bureau of Democracy, Human Rights and Labor, said at a National Endowment for Democracy event that the United States is “looking for a way to engage constructively with our partners in the government of Azerbaijan.” At the same time, Melia said the United States “will continue to support the independent voices that are seeking to move their country more briskly into the modern democratic world.” The comments came amid what Western officials and human rights activists describe as a crackdown on critics of the government in the oil-rich Caspian nation. Russian Foreign Minister Sergei Lavrov has said that the decision to quit from the US-Russia Presidential Committee’s working group on civil society was America’s own choice, adding Russia was in no position to change it. “We were notified only orally, no written announcement was submitted to us in this respect,” the minister said at a Moscow press conference. 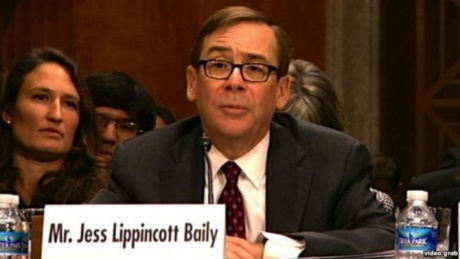 The Coup Factory’s man in Macedonia is Jess Lippincott Baily. Macedonia is not the only European country lining up on Russia’s side or threatening to do so. With the coming to power of Syriza in Greece, Moscow has another potential ally in a sensitive situation where the EU would like to keep Greece in the Eurozone while keeping them deep in debt and cowed to the whims of Brussels and committed to killer austerity. After the Syriza party came to power in Greece in January, it quickly emerged that members had been in correspondence with Alexander Dugin, a Russian ultra-nationalist admired in some Kremlin circles who has called for a genocide of Ukrainians. So… some “members” of Syriza were “in correspondence” with an ultra-nationalist who is “admired in some Kremlin circles”? How damning! Truly powerful journalism on the part of the Telegraph. No sooner did Syriza come to power than the West labelled them “an emerging hub for terrorists”. What next? If Greece says no to further sanctions against Russia, will we see ISIS beheadings in Athens? …while the signs coming out of Greece may seem positive at first, there is an ominous cloud approaching – the cloud of George Soros and his color revolution apparatus. Once again, appeasement encourages the aggressor to greater acts of violence. Time to step up our policy based on cold facts, not illusions. Orban specified that the Baltic States and Poland sided with the United States in their belief that Russia should be gradually excluded from cooperation with Europe. On the other hand, Hungary, Czech Republic, Slovakia, and Austria, Orban claims, believe cooperation with Moscow is essential. Orban’s foreign policy towards the Ukrainian conflict has been criticized in the West from the onset as too soft. Generally supporting a Moscow-backed approach of achieving a long lasting peace in the region, Orban has on numerous occasions spoken out against discriminatory treatment of Russia by Brussels. Not so long ago, Senator John McCain called the Hungarian PM a neo-fascist dictator, which is strange given John McCain’s role in helping the fascist junta in Kiev come to power roughly one year earlier. Orban told Russian newspaper Kommersant that he did not want to live in a Europe heading toward a new Cold War with Russia, making Europeans Russia’s enemy. Hungary can clearly see the advantage of developing bilateral relations; it can actively campaign for lifting the EU anti-Russia sanctions and return to normal cooperation between the European Union and Russia. Hungary is not alone. There are enough dissenters in Europe: the Czech Republic, Slovakia, Greece, Cyprus and Austria. Italian Prime Minister Matteo Renzi has expressed discontent with regard to the anti-Russia sanctions. Inside the countries that initiate or support the sanctions there are business circles that feel no admiration for the idea. Attempted coup in Hungary, with involvement of Thomas O. Melia and George Soros? Potential or actual Russian allies in Europe include Macedonia, Hungary, Greece, Italy, the Czech Republic, Slovakia, Cyprus, and Austria. What about France? France has shown signs of unease with the Russophobic policies of the EU. Recall that French President François Hollande visited Moscow in December 2014, not long before the Charlie Hebdo shootings drastically shifted the discussion away from Hollande’s suggestions that sanctions were counterproductive and should be lifted if possible and soon. It seems that any country that wishes to break away from the NATO/US/EU anti-Russia line-up finds itself confronted either by a mob of “pro-democracy” Maidanists, or by terrorists. French President Francois Hollande met with President Vladimir Putin during an impromptu visit to Moscow on Saturday, a rare display of goodwill as tensions remain high over the ongoing conflict in east Ukraine and France’s decision to suspend the delivery of two warships to Moscow. The French leader’s unexpected stopover in Moscow, as he traveled from neighboring Kazakhstan back to Paris, makes him the only head of state from a major Western power to visit Russia since it annexed Ukraine’s Crimea peninsula in March. Hollande seems to be braver and braver as the days go by in his rejection of NATO’s policy of Russophobia. French President Francois Hollande said Friday at a joint news conference with German Chancellor Angela Merkel that he was unable to confirm the presence of Russian military hardware in Ukraine. The grand prize in all of this has been, and remains, the destabilization and break-up of Russia, and of course the overthrow of Vladimir Putin, or Putler, as the less astute among us call him. Putin critic and blogger/activist Alexei Navalny was arrested in the Moscow Metro on Sunday Feb. 15 for agitating and handing out these Spring fliers. This entry was posted in Uncategorized on February 21, 2015 by bperet.